The legal battle over the use of the Lotus name in Formula 1 is to hit the courts much earlier than originally anticipated - with the car company's bid for a summary judgement to be heard next week. It had been expected that the legal row between Group Lotus and Team Lotus would not be in court until the early summer. But Group Lotus is seeking a summary judgement on the main legal issues – that its early termination of its licencing deal with Lotus Racing was a breach of contract and over whether Team Lotus is allowed to use the name in Formula 1 this year. The matter is set to be heard in the London courts on January 24. A summary judgement is applied for by parties involved in legal disputes as a way of trying to avoid a full-blown trial and all the legal costs associated with it. 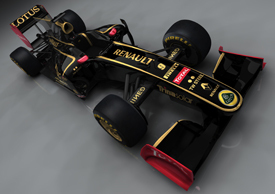 In a separate development, the Renault team's plans to run a black-and-gold livery for title sponsor Lotus has come under the spotlight of anti-tobacco campaigners. With the colour scheme synonymous with the John Player Special sponsorship of the 1970's and 1980's, concerns have been voiced in Canada about whether the team will be allowed to run it there because of the country's strict anti-tobacco advertising legislation. A spokesperson for Health Canada, which enforces the country's Tobacco Act, told the Toronto Globe and Mail: "Tobacco inspectors would need to fully review to assess whether a violation of the Tobacco Act has occurred. "The Tobacco Act prohibits the promotion of tobacco products or tobacco product-related brand elements in Canada, except as authorized by the Act or regulations. Tobacco product sponsorship is prohibited entirely and tobacco advertising is severely restricted." Group Lotus CEO Dany Bahar told AUTOSPORT in December that he was not worried the black-and-gold colours would be linked with tobacco. "I don't think we are using the kind of logos that the John Player Special cars used," he said. "I simply believe, and again this is my personal opinion, I believe this is one of the two most beautiful liveries in Formula 1. This is why we will use it, and nothing else. I do not believe we will have any negative implications with potential tobacco advertising."